My first book by this author so I wasn’t sure what to expect. 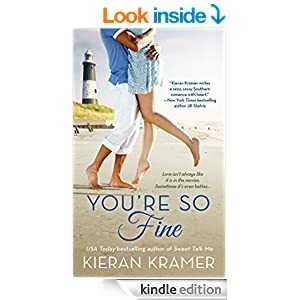 I got the romance I love, and some of the drama, though that’s a little low key for me, but I also got a male lead with fabulous Southern charm, a female lead with wit and spark and Henry – the most wonderful little boy anyone could wish for. He was a real star, so sweet, so intelligent and forgiving, and in some ways old beyond his years, and then he’d say something that brought home to me that really he was just a little boy, wanting things all kids should have, people who love him, a stable and happy home, and lots of fun in life. That’s really not too much to ask is it? Still, poor Henry has just Lacey, and her mum and stepfather, who don’t really approve of the adoption. She’s still trying to win their love but its a tough struggle, and I feel like she’s someone who just wants everyone to see the best in her, who’ll bend over backwards to help people – as she has in the past – and she’s just been taken for granted. I’d have liked to know more about how she and Henry came together ( maybe that’s in another of Kieran’s books?) I love Lacey, ( yes and Lucy, I loved watching that when I was a kid) and she’s trying so hard to make a home for Henry, and be the perfect parent. She’s not had much example though from her own mum and stepfather….Then Beau drops into their life and though the first meeting doesn’t go well, its not long before he’s charmed his way into Lacey and Henry’s life. Henry adore him – and who wouldn’t? He’s got the charm adults love, he’s a really genuinely pleasant man, and he’s fun with Henry….treats him as a peer, or perhaps its that Henry treats him as a child, and brings out the fun side of Beau at a time when people treat him too often as just the film star he is, and not Beau the man. Lacey and Henry don’t do that and he appreciates it, people who see him for what he is. Its not long before they are closer…and much closer, though Lacey puts a line down sexually which she won’t cross. She knows Beau will go when the film is over, only a few weeks away, and she needs stability for Henry, and wants to protect her own heart. The film crew are great too, from Mike the director, a kind man, his young twins Carol and Bob who become fast friends with Henry. They’re like a tiny three Musketeers with an honorary fourth in Dickie, Mike’s father in law, who delights in stories and lies and is adored by the kids. Its a beautiful romance, not angsty and full of heart stopping drama, but one that creeps up slowly sucking the reader into another world, twisting and turning as other plot lines creep in and secrets come out. Its a really enjoyable read with a perfect satisfying ending. Its the sort of read I’ll pick up when I want a reminder of how people can be good, how there are genuinely nice types around ( though there’s a few nasty b itches here too) and I just want to relax and slide into a world of sunshine, beaches and happiness. Stars: four and a half, it doesn’t quite have enough for five from me but is close.